Jubilation erupted among the Kami, Damai and Sarki communities when chief minister Mamata Banerjee today announced their respective development boards at Chowrasta in Darjeeling. The chief minister made this announcement at a programme organised to celebrate the 202nd birth anniversary of illustrious Nepali poet, Bhanubhakta Acharya. To mark a momentous event, President Pranab Mukherjee today joined the people of Darjeeling. The programme was organised by the West Bengal information and cultural department, where also in attendance were West Bengal Governor Keshari Nath Tripathi and GTA chief Bimal Gurung. The celebrations took place at Chowrasta where a temporary dais was set up and television screens placed to broadcast the event. 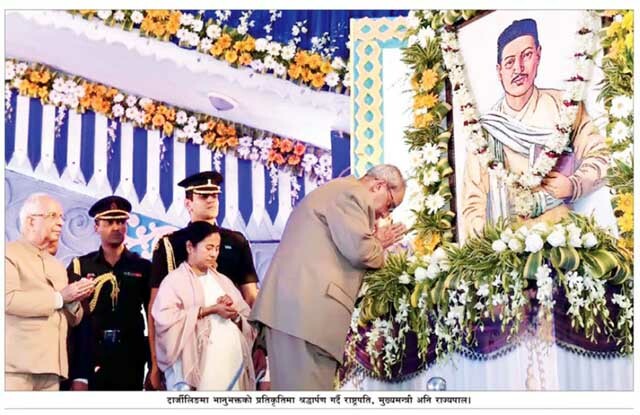 The birth celebrations were kicked-off by the garlanding of the statue of Bhanubhakta Acharya by the President, chief minister, Governor and other guests. Ethnic communities such as the Rai and the Mangar presented cultural performances, while Karthik Das and his troupe presented a Baul performance. Bhanubhakta Acharya, considered as the foremost Nepali poet, was born in 1814. He is attributed with translating the epic Ramayana into Nepali and is addressed by the honorific ‘Adikavi’ (first poet). Governor Tripathi said the form, the respect and the status accorded to the Nepali language by Adikavi Bhanubhakts was unique. He noted that the work of taking the Ramayana, respected and worshipped in every Hindu household, to the masses in their mother tongue, has been very commendable work. Chief minister Banerjee announced her government would hold meetings of the state cabinet in Darjeeling from time to time. Jubilation erupted among the Kami, Damai and Sarki communities when chief minister Mamata Banerjee today announced their respective development boards at Chowrasta in Darjeeling.